Out of a trance and into a quandary. 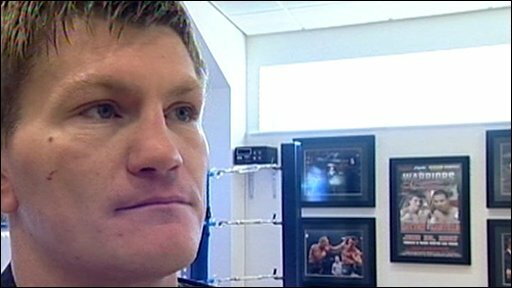 Ricky Hatton has a big call to make. Time to get his coat? Or one more for the road? 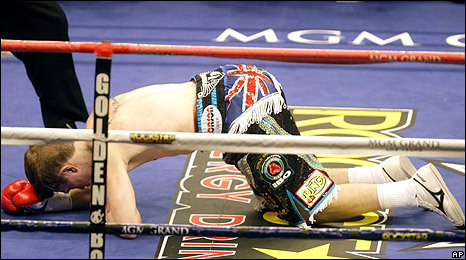 Soon enough, Hatton will be introduced to Life After Boxing. From what we learned in the making of this documentary, the adjustment can be torturous. And the fall is so much harder for those who climb the highest. Hatton has enjoyed adulation on a scale which surprised even Las Vegas. But what happens when the roar of the masses fades, when "There's only one... someone else"? "Success in the ring is like a Class A drug," according to Barry McGuigan, the former world featherweight champion who joined me in co-presenting the programme. Little wonder he's among the majority who needed more than one go at shaking off the habit. The brutal, gladiatorial nature of their profession means boxers tend to suffer more than others in filling the void created by retirement. As Barry points out, and knows from experience, death in the workplace is a very real prospect. Only the strongest of minds can cope with the presence of that ghost at the window. At the highest level, even for the very best, pain is a constant. And having given so much of themselves in mind and body, there is a reaction from boxers when the rewards are less than commensurate. "I was worth a lot more than that," said Ken Buchanan as we talked in a gym in Edinburgh. Was he talking about money or recognition? Probably both. And his sentiments would be echoed by many who've dabbed and squealed at welts and bruises down the years. He did it the hardest way. A Scot whose complexion could hardly be paler, he won a world title against a Panamanian in the mid-afternoon heat of an open-air stadium in Puerto Rico. He was one of Britain's finest. Yet when he reflected on his Life After Boxing, it was like listening to one long car crash. Trouble, whether invited or unjust, has been his travelling companion. If only the control he mustered in the ring had followed him out through the ropes. But even champions can't have it all. Bitterness is an emotion best bypassed but not easily avoided by men who prospered in the realm of extreme confrontation. Nigel Benn sees it more rationally now than he once did: "Everyone was around me to see what they could get out of me." The one-time youngest heavyweight champion of the world, Floyd Patterson, told me years ago that, on winning the title, he suddenly had a friend for every dollar he earned. He found the fortitude to fend them off. But it's another of boxing's paradoxes that characters who are so strong in the ring are often weak in dealing with people outside. So streetwise yet so naive. But lest we be accused of indulging in a sympathy-fest, Benn and Frank Bruno hammer home a recurring theme in the programme: you take the risks, you know the pitfalls, you accept the consequences. The promoter Barry Hearn believes that fighters should harness the qualities needed in boxing and use them to forge a life beyond the final bell. Commitment, determination and dedication are all to be found along the route to prosperity taken by Billy Walker, Dave "Boy" Green, Larry Holmes and others. Their number might be the minority - but their cases then become all the more exemplary. The presence of a strong network of family and friends is vital. Hatton, Joe Calzaghe, Naseem Hamed and Lennox Lewis are recent British success stories underpinned by the presence of their nearest and dearest. Bruno tells us candidly how he fell apart only when his family did. In that respect, Hatton is in decent stead. He now wants time to consider. Remembering images of his eyes blinking as he lay otherwise motionless on the canvas in Las Vegas this month, it's hard to believe he could be contemplating a return to the scene of his prime. But boxers are a species apart. We ask "Why?" They ask "Why not?"